New Zealand’s premier provider of higher education in the creative arts, and internationally awarded multi programme University with a 132 year history in Wellington. is ranked the top design school in the Asia-Pacific region, and 94% of students find work within 6 months of graduating. Aurora 44 is striking pay dirt in the international games market. Their latest RPG Ashen was named “best” and “most-promising” at the 2017 E3 Games conference. Chamber Music New Zealand brings music to the people, touring the best of local and international artists, commissioning new works and mentoring players at all levels. Mixt is a content creation studio working with forward thinking brands to create smarter, interactive ways to engage their users, in the real, augmented and virtual worlds. Taki Rua Productions is our oldest Māori theatre production company, bringing traditional culture to a modern multicultural world, producing and presenting kaupapa Māori theatre all over the world. Wrestler is a no-holds-barred combination of an ad agency and a production company. They’ve got a strong focus on story-telling through technology, especially technology that hasn’t been invented yet. an international money transfer business, focuses on providing the best foreign exchange rates, fast transaction settlement and exceptional customer support, transferring close to $1billion a year. RIP Global has developed a unique product to rid the world of expense receipts - RIP Expenses - automating expenses at the buy stage, so clients pay, then walk away. Thankyou Payroll is cloud-based payroll software and a social enterprise donating a portion of an IRD payroll subsidy to the Thankyou Charitable Trust funding community activities all over New Zealand. Thundermaps is building the largest database of dangerous locations in the world and provides a simple interface to clients, to enable them to keep their people safe and secure. Xequals is a web development and digital design agency. From humble beginnings on Dixon St with zero investment, it’s now an international success story with clients in six countries. Ferrier Research Institute has developed a new cancer drug called Mundesine, the result of a revolutionary new drug design strategy that keeps cost down and effectiveness up. Dogmatek has found a better way to get musician’s feet tapping, with a line of high quality effects pedals offering the warmth of analogue and the functionality of digital. Wash Plant - Flight Plastics Flight Plastics has taken recycling to extremes –they take old plastic containers, put them through a special process to make new ones, and repeat. Over and over again. Smart City - WCC & NEC NEC and Wellington City Council are partnering to develop a “smart city” ecosystem to gather information on how people use our city and then help them use it better. is a low-cost investment platform breaking down the barriers that stand in the way of investing, and giving investors with $50 the same opportunities as someone with $50,000. Basil Jones Metal Spinning has been spinning metal into useful objects for over thirty years, with attention to detail and service giving them an edge over multinational corporations. Excio is a platform that lets people and organisations share ideas and information through captivating images and wallpapers sent directly to the home-screens of their audience’s devices. Method makes recycling bins for offices - bins that look good, work well and divert waste from landfills – and they’ve sold over 13,000 in the last year alone. Reid Brothers Distilling are the Gin brothers. Native Gin, their flagship spirit, uses three native New Zealand botanicals and sells very well here, in Australia, the UK and now Japan. Six Barrel Soda Co makes bottled sodas and syrups, with fresh, natural ingredients. Since bursting on the local scene in 2012, they’re now selling around NZ and in Australia. NZ’s first electric car share business, launched in May last year with support from the likes of WCC, and Z Energy. Already 500-plus Wellingtonians are enjoying the ride. Allsorts technology coupled with AI is helping employees and employers – it’s just like a dating app except it helps you find your perfect match in work. Storbie is an online platform giving individual businesses a standalone online presence, with the option to come together in marketplaces and benefit from being part of a larger brand. Straight Flush Plumbing is a maintenance-based plumbing, gasfitting and drainlaying company. They’re always on the lookout for ways to do things better, bringing benefits to staff, customers and the business. The Digital Café recognised that SMEs are often ignored by bigger agencies so leapt into the void helping them grow through the clever use of social and digital media. TOMM is an outcome measurement tool developed by Kapiti Youth Services and Luvly that helps organisations providing services for young people to track how their programmes are working. has established a reputation as the global expert in substation timing with clever little clocks that keep time better than the competition, you can rely on that. Concentrix has been providing business solutions worldwide and in Wellington since 2016. Back then they had one client and 50 full-timers. Now there are 220 people working here. Hills Hats reputation for melding innovation with traditional hat-making methods is turning heads worldwide – to the extent that Lady Gaga has been spotted wearing a Hill’s beret. Kaynemaile The future looks shiny bright for Kaynemaile, the architectural mesh launched in the world’s busiest pedestrian plaza – Times Square, NYC - and is winning awards around the world. The Cargo Cult is a Software design company which has developed post-production tools that have become industry standards used by major sound mixing facilities in almost every corner of the world. has taken boring to high-tech levels with the country’s first fully wireless drilling rig and a sophisticated SONIC drill that’s working extremely well for geotechnical analysts. Capital & Coast District Health Board To meet the on-going demand for health care services Capital & Coast District Health Board has implemented a new model of primary care – HCH – that’s getting positive results across the region. Hutt Gas and Plumbing has become one of Wellington’s largest plumbing firms, thanks to a deeply felt commitment to innovation, staff training and doing things the right way. Maven Consulting is an international professional services company designing and delivering solutions for change, with a portfolio of successful projects across New Zealand, the Pacific and the Middle East. Stantec NZ plans, designs and delivers water infrastructure and roading projects across the Wellington region. Every project is designed with its community in mind, and Stantec NZ stays on board throughout. Te Omanga Hospice was the first home-based hospice service in New Zealand to provide a programme of total care. Today no other Hospice provides that depth of therapies and service. 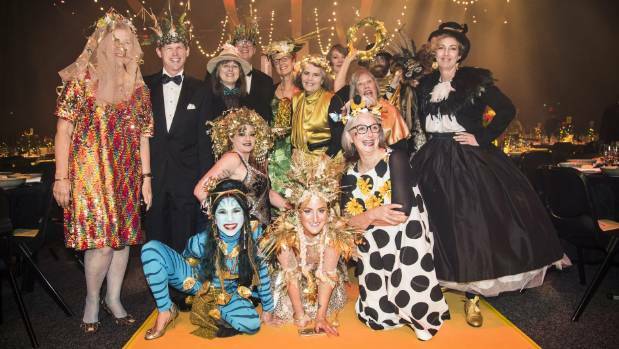 is an annual showcase the best of Wellington’s culinary and hospitality businesses, to make Wellington one of the most recognised food cities in the world. All Whites vs Peru NZ Football worked hard to ensure the All Whites’ World Cup playoff against Peru at Westpac Stadium last year was one of the biggest football matches ever seen in New Zealand. Asia-Pacific Amateur Golf Championship The Royal Wellington Golf Club aced every aspect of the event when it hosted 116 of the world’s best golfers at the Asia-Pacific Amateur Championship in October last year. Beervana had its start in the old Overseas Terminal with 200 punters - now the annual celebration of beery things packs out the Westpac Stadium. CubaDupa is New Zealand’s largest street festival, celebrating the vibrancy and spirit of Cuba Street and the wider community - uniquely Wellington and something that couldn’t happen anywhere else. one of the country’s largest broadcasters, has made capturing all the action trackside while keeping everyone safe, their top priority, and it’s paying dividends. Ministry of Justice has made court a safer place with a holistic health, safety and security programme that puts people – clients, staff and visitors - first. Safety Wingman - Wellington Airport & Arrow International Wellington Airport has taken safety to new heights with its Safety Wingman programme, working with Arrow International on the construction of the new Rydge’s Airport Hotel. Te Omanga Hospice provides expert palliative care throughout the Hutt Valley along with an expert health and safety programme that’s been a huge success with staff and contractors. is investing $12 million in a plant recycling plastic food containers, the first step towards Flight’s vision of a plastic circular economy for New Zealand. Conscious Consumers is a social enterprise that has developed a technology platform connecting concerned consumers with responsible businesses that are making a difference to the world, every day. Mevo is NZ’s first electric car share, giving Wellingtonians access to driving without having to own a car. Each Mevo car can replace between 5 and 15 private vehicles. RemarkIT Solutions is dedicated to “Reduce, Recycle, Reuse, Resell” of computer hardware and technical equipment, keeping e-waste out of landfills and providing employment to a predominantly young technical workforce. Sustainable Business Network wants NZ to be a model sustainable nation. They’re providing inspiration, resources and knowledge and plenty of elbow grease to get things started. Wā Collective aims to make tampons and pads redundant with the sustainably produced Wā menstrual cup, and getting people talking about a topic that currently flows under the radar. is proud to be one of the world’s leading inventors, and marketers of juvenile products. Their HR style is all grown up, empowering staff through trust and opportunity. Bradley Project Management has clients throughout NZ. Staying on top of the work means making sure their staff stays on top, with a comprehensive lifestyle and wellness programme. Construction Contracts Limited has introduced a multi-faceted communications system, based on the company’s core values to make sure everyone’s always in the loop, no matter where they’re working. Humankind provides HR services to small and medium organisations, passionate about building better workplaces and driven by the desire to help people love what they do. Especially their own. Hutt Gas and Plumbing has one of the most highly qualified and specialised teams across Wellington, thanks to a philosophy that encourages upskilling, higher learning and career planning. Original generation time 3.9059 seconds. Cache Loaded in: 0.0007 seconds.